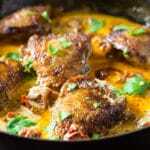 Creamy Sun-Dried Tomato Chicken, the restaurant-style dish you’ve been waiting all your life for! Picture this: You’re sitting in a candle lit, romantic restaurant and being served this Creamy Sun-Dried Tomato Chicken with a side of pasta. Beautiful music is playing, there’s a gentle clinking of expensive cutlery, and there are no screaming kids in sight. Also, no spilled cups of juice. Sigh, what a beautiful evening it’s turning out to be. Just kidding! Because you’re a mom of little ones (with no babysitter in sight), the laundry hasn’t been done in ages, so you have no beautiful dress to be wearing in the restaurant anyway, and also there’s a little one tugging your hand, begging you to colorrrr with them. And also, you have zero energy to actually go out to a restaurant and adult anyway, because you haven’t slept in like years. So I’ve got a little idea for you. Put the kids to bed, and make this delicious dinner, and have it in front of the television in your comfiest PJ’s. Could life be any better? I don’t think so. For all you tired mommies, who just want to have a restaurant worthy dish, but don’t have the energy or time to get all dolled up for a dinner at a fancy restaurant? 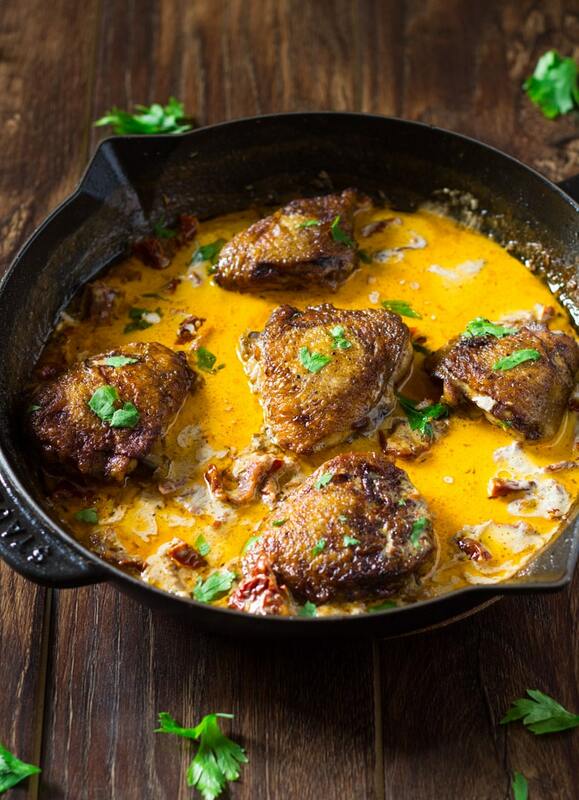 This Creamy Sun-Dried Tomato Chicken is perfect for you! Also, it’s fairly easy to make, without much effort required on your part. 1.) Put kids to bed. 2.) Put on some soft, light music (beware this step might wake up your kids if they tend to wake up at the slightest sound – so do this step on your own risk :P). 3.) Take out that iron skillet of yours (or any oven-safe skillet) and sear those chicken thighs until they are golden brown and crispy. Mmm, now we’re talking. 4.) Time to make the sauce – which is by the way totally drool worthy. Don’t forget the sun-dried tomatoes, which your sophisticated mac n cheese loving toddler turns up his nose upon. Lol. Now’s the time to use those gorgeous red beauties. 5.) Place those golden beauties (okay, chicken thighs) into the sauce and let them bathe in the oven until fully cooked. Okay, that’s a weird sentence, but whatever. I currently have a toddler tugging my hand, to colorrrrr with her as I write this post. So bear with me. :p Also don’t forget to boil the pasta or whatever while the chicken is in the oven. 6.) While the skillet is in the oven, you go and change into your pj’s, and do your nightly routine of moisturizing or whatever. LOL. As if. 7.) Put on your favorite tv show (may I suggest FRIENDS?) and wait for the magic to start. 8.) Once the chicken and pasta is ready, serve yourself a huge helping, because you deserve it after a looong day. 9.) And eat in peace, without being interrupted every few minutes by a toddler. 10.) Success! You’ve had a delicious dinner of Creamy Sun-Dried Tomato Chicken in peace, and you didn’t even have to dress up for it. Hooray. Now, you may fall asleep, until it’s morning and everything begins all over again. 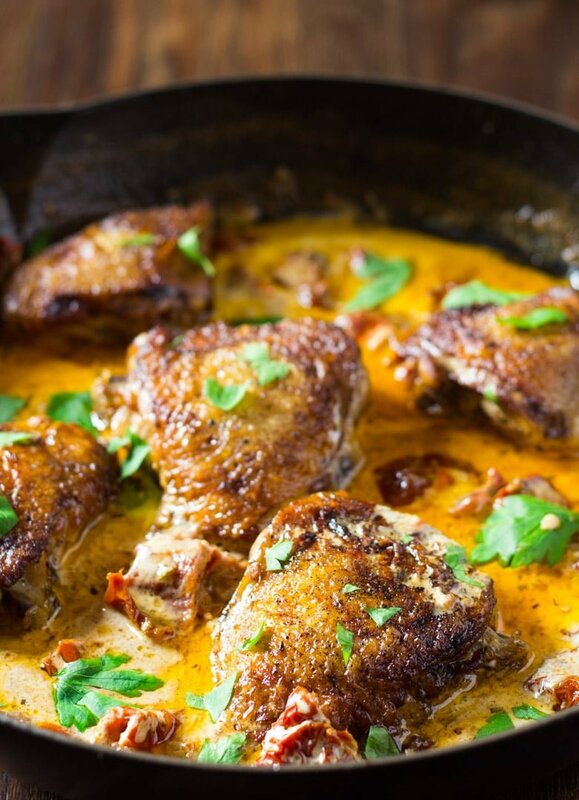 Learn how to make this Creamy Sun-Dried Tomato Chicken at home which has a drool worthy creamy sun-dried tomato sauce with crispy chicken thighs! 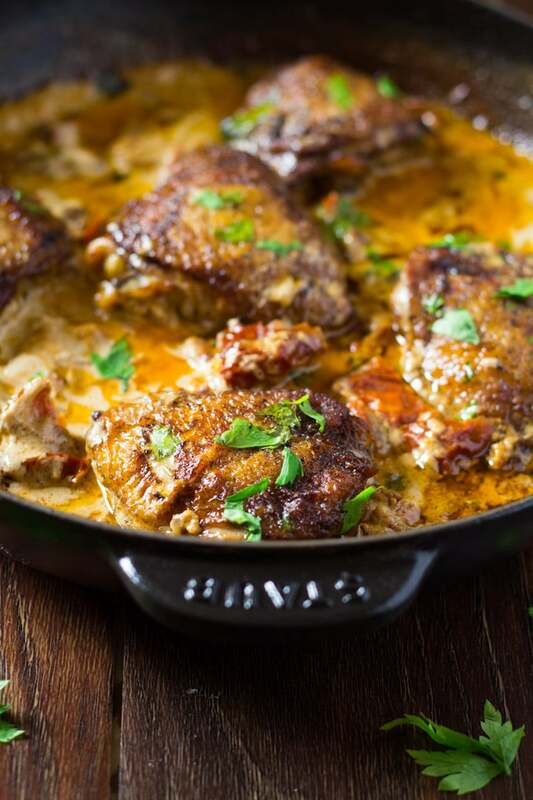 Melt 1 tablespoon butter and 1 tablespoon oil in an oven safe skillet, and place the chicken thighs skin side down. Sear on both sides until golden brown, for about 2-3 minutes on each side. Remove from skillet, and set aside. Melt remaining 1 tablespoon of butter and oil each, and add the garlic and red pepper flakes, and cook for 1-2 minutes, stirring frequently, until fragrant. Now stir in the chicken broth, heavy cream, sun-dried tomatoes, parmesan, dried thyme, dried oregano and dried basil. Bring the sauce to a boil, and then reduce the heat and simmer until the sauce has thickened slightly. This will take about 3-5 minutes. Return the chicken thighs to the skillet, and place in the oven and bake until the chicken thighs are cooked through. This will take about 25-30 minutes. Garnish with chopped parsley, and serve immediately. Hi Wajeeha! Thanks for sharing those lovely recipes..I have not tried any of them yet,but when I do I will most definitely let you know..stay beautiful..God Bless..❤?